This important book is coming out next week.Look for it on your favourite online bookseller! I think it is the most important thing I have done in my life – my legacy to future generations – and I want it to spread as far and wide as possible. This book is rooted in the soil of the traditional ways of caring for children of our First Nations communities in North America, as I have in my travels observed them among parents in various of those communities that have managed to retain these ways more or less uncontaminated by the invading European attitudes that were so disrespectful of children. 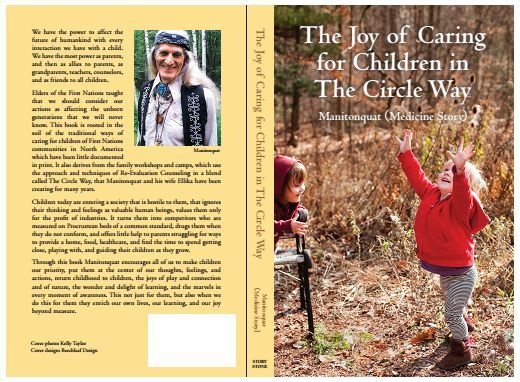 That circle way of community caring for children has been little documented in print, and it was a primary interest for me as I travelled in my youth, listening to elders and family members of all ages across the US and Canada. Out of that soil my wife Ellika and I have for many years cultivated in our family workshops and camps the growth of cooperative caring for children, of parents helping each other to give the best of themselves to their children and each other using the approach and techniques of Re-Evaluation Counseling in a blend we call The Circle Way. A further goal to enlarge the scope of that caring will be found in the final two chapters of the book, namely of Parents Liberation and the creation of new communities that return to our indigenous values of cooperation, sharing, caring for each person from child to elder, together caring for all beings, all life, and for our beloved Mother Earth. In the tribes, there isn’t really a separation of child and adult, or old person, or teenager. The children are as important as the old people, but they have different strengths and weaknesses. Everybody works together as a community, as a unit, because you need each other to function and survive.